As a body piercer I have seen plenty of piercing trends come and go over the years. Much like the fashion industry, certain styles will be in vogue at the moment, then will lose their popularity, only to inevitably be sought after again years later. Piercing is very similar, in which a certain piercing or piece of jewelry will gain widespread exposure (usually due to a musician or Hollywood celebrity) and clients will line up in droves, ready and willing. Some of us remember the Korn triple eyebrow, the Rihanna chunky septum clicker, or the recent Pintrest Behemoth: the Triple Forward Helix. Currently, the craze that has taken our industry by storm is CURATION, specifically ear curation. When we hear the word “curation” one normally tends to think of an art curator, hand-selecting pieces for an exhibit or gallery. An ear curation session would essentially include a body piercer assessing your anatomy and then proposing piercings that would best suit you. The concept is nothing new to body piercers, who have been assessing anatomy and suggesting specific piercings for decades. However, the practice only recently acquired a trendy name. I myself have referred to it as “ear styling” for years. I would ask clients if they wanted me to “style” their ears by removing piercings that were causing clutter, or adding piercings to balance an ear out. I would take a picture of their ear with my cell phone and then draw out different ideas right in front of them, showing them why certain piercings would work best and why others were not possible. Drawing on my phone is still one of the most convenient ways I have found to visually assist a curation. Picking out jewelry combinations would come next. To get the full curating experience, jewelry selection is paramount. There are many factors at play when it comes to putting together a cohesive jewelry ensemble. What metal tones go best with your complexion? Do you have a favorite gemstone? If not, would you want a subtle stone, or one with a high contrast against your skin? Is your personal jewelry style more modern, bohemian, or is there an ethnic flare? The jewelry being selected in some cases is even more important than adding another piercing. 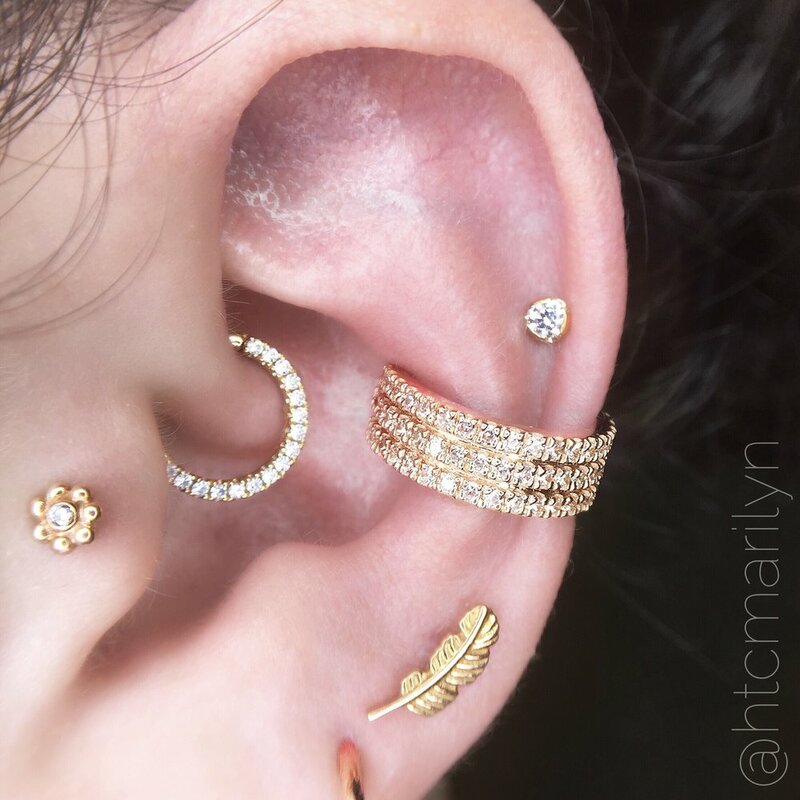 You can have your ear curated with jewelry alone and not even need to obtain a new piercing. Ear curation, hands down, is my favorite trend to date. It lets me pull to light the artistry in body piercing as well as my personal adoration for precious metals and gemstones. Although not all curations need to be performed with high-ticket items, the array and variety found in gold, as opposed to steel or titanium, is more extensive. We have come a long way from the days of piercings being a sign of rebellion. 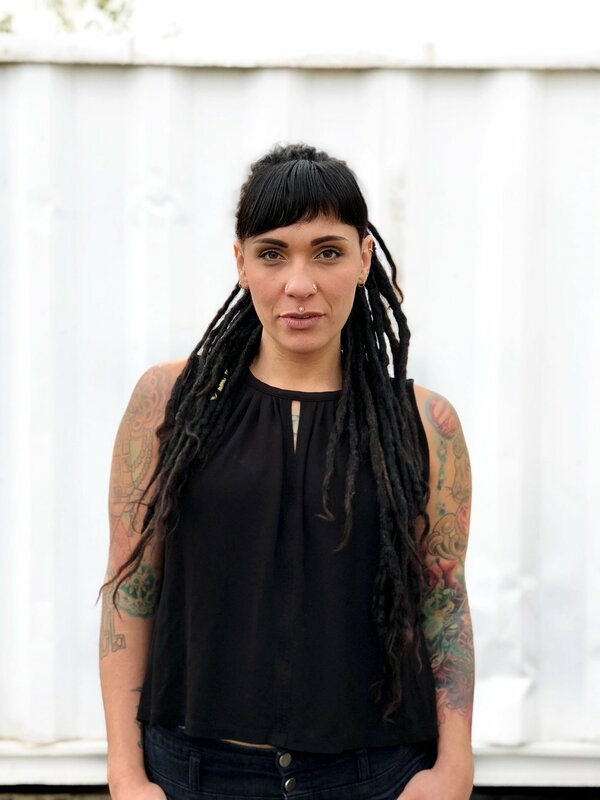 Body piercings will always be a form of self-expression, but now they fall in line more-so with a fashion statement instead of strike against the status quo. Considering piercings only as accessories does take a lot of the depth out of body piercing as a whole. But, no matter how trendy you think it is, piercing will always be ritual. There will always be a sharing of energy, the shedding of blood, and a bond created. I have some of the best relationships with clients whose ears I have curated. You have to know and understand so much about who your client is and what they are about to make the most personally tailored choices with them. That connection is special to me, and I am grateful that this new trend helps facilitate more of these experiences.